It is no contest that Tahoe is one of the premier vacation destinations in the world, and as and one of the first ski resorts to open in Tahoe, Granlibakken has been host to generations of visitors who come to the 74 acre wooded property to make memories and seek thrills. From its incarnation as a winter recreation hill for the posh Tahoe Tavern to its current operations as a family-owned conference center, lodge, and ski/sled hill, Granlibakken has a rich and varied history in the Tahoe region. In 1926, the valley just outside of Tahoe City where Granlibakken is situated was acquired by the Tahoe Tavern for use as their winter sports grounds. Granlibakken’s location and sheltered ski hill were a winning combination, and Granlibakken’s renown in the snow sports world was cemented. In 1929, the ski hill won the bid to host the Olympic ski jumping trials for the 1932 Lake Placid Olympics, putting Tahoe on the map as a winter sports destination. 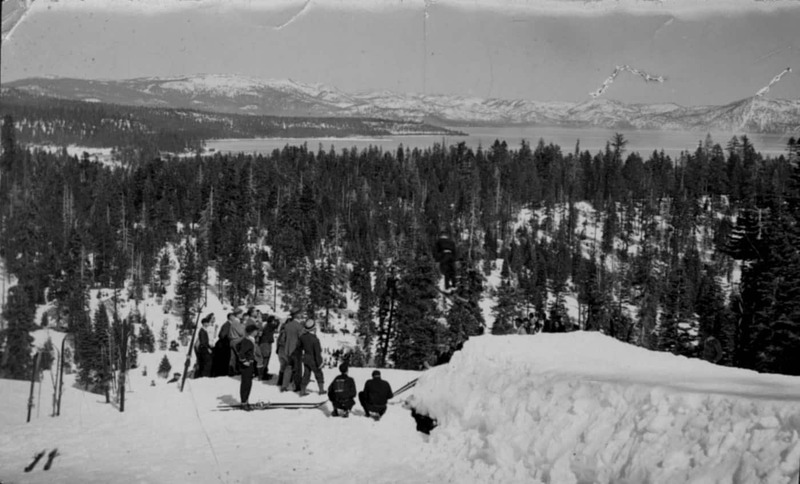 In the years before WWII, the Olympic ski hill became a staple in the Tahoe community, as a proving ground for many of Tahoe City’s youth and visitors alike. In 1947. Kjell “Rusty” Rustad and his wife Marion leased the land from the Tahoe Tavern, naming the hill “Granlibakken,” reminiscent of a ski hill that Rusty enjoyed in Norway. Granlibakken means “hill sheltered by fir trees” in Norwegian. Rusty extended the existing rope tow, and added a smaller rope tow for beginners. The Granlibakken ski hill began to gain a reputation as one of the most accessible and best places to ski in Tahoe City, with ski jumps for adults and juniors alike and transportation to and from Tahoe City via a Weasel snowcat. Rusty built a log warming hut and some lodging rooms at the base of the ski hill, making Granlibakken’s first foray into the world of hospitality. In 1958, the UC Berkeley International House purchased the land across the road from the Granlibakken ski hill, and built a lodge, swimming pool, and dining area for Berkeley alumni use. In 1978, the property was purchased by its current owners, the Parson family. Since the Parsons acquired Granlibakken, they have preserved its old-Tahoe charm, while making improvements. Granlibakken Tahoe is now known as a family-friendly resort with a number of great amenities onsite. Granlibakken’s successful conference center has become a favorite for conference planners, and is also host to family reunions and weddings. The wide variety of lodging room options and the choice of several types of meeting spaces onsite make Granlibakken the perfect location to hold a gathering for groups of any size. Granlibakken’s ski and sled hill is now one of the oldest continually operated ski resorts in California. You can still picture the early days of Granlibakken when you enter the log and post beamed ski hut at the base of the hill, which still boasts some architectural components from its original construction. The Granlibakken ski hill is the perfect place for beginners and families to get on the slopes while avoiding the crowds at larger resorts. The whole hill can be viewed from the lodge, and the terrain is approachable for beginner and intermediate skiers and riders. Sledding was added by the Parsons to expand Granlibakken’s offerings. The sledding hill is guaranteed to be a crowd-pleaser, fun for kids and adults alike. And if you can’t decide between the activities, fear not, because a skiing day pass is also valid for sledding at Granlibakken. Granlibakken has come a long way from its humble roots as a recreational hill for The Tahoe Tavern. Granlibakken Tahoe has been in the business of making memories for generations, and will continue to provide families unforgettable experiences for many years to come. This entry was posted in 95th Anniversary Blog Series, Family Getaways, gutenberg, News & Updates, Uncategorized. Bookmark the permalink.